While McDonald’s have publicly dismissed the strikers as a dissident minority, the threat of an assertive workforce with public support is already getting results. Managers accused of bullying have been suspended. 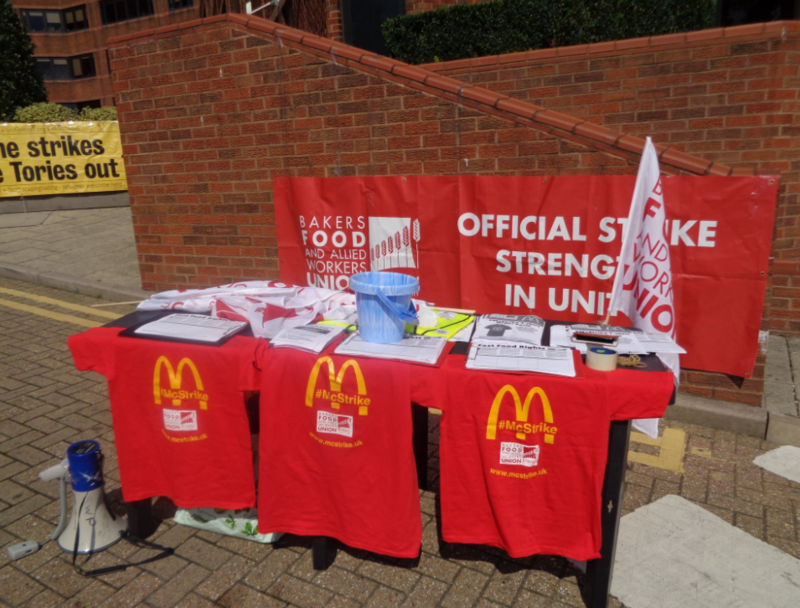 When ballots were called, McDonald’s informally promised to end zero-hour contracts by the end of this year though they have so far refused to formalise agreements with the union. Workers demand written guarantees of hours, a £10 p/h wage and formal trade union recognition. They also want to end a toxic workplace culture where bullying is endemic. Lewis, a 27 year old Crayford employee, describes McDonald’s management as being far harsher than those he has had in previous roles. Shen, another Crayford striker, gave an example. When a Cambridge store worker asked a manager to stop screaming at her because she had been a victim of domestic violence, he responded with laughter, telling her to ‘Leave it [personal circumstances] out of work’. Stories like this are the tip of the iceberg. Still, many workers fear material and psychological reprisals for organising. Managers weaponise ‘precarious scheduling’ by cutting hours for difficult employees. High employee turnover also makes unionising difficult. Even with mounting press attention, McDonald’s management have dropped into the Crayford restaurant daily to try and intimidate staff before Monday. Lewis and his colleagues managed to organise a union at Crayford McDonald's after abuses were repeatedly ignored by management. ‘When we found out about BFAWU (Bakers, Food and Allied Workers Union) and started talking to each other more, we found that the only way to deal with these problems would be to go on strike. We were left with no other option.’ These strikes promise to embolden McDonald’s employees nationwide and internationally to organise in the face of management intimidation. McDonald’s international presence has fostered a worldwide groundswell of anger. Working with unions and workers from America, New Zealand and continental Europe, Lewis found that workers abroad face 'very similar conditions’. Monday’s strikes will also come 15 years after international wildcat strikes among McDonald’s staff. Loosely co-ordinated by McDonald’s Worker Resistance, the 2002 protests and walk-outs against ‘sick wages and dire conditions’ happened in France, England, Mexico, Italy and other countries around the world. The Crayford and Cambridge McStrikers have also tapped into this international animus. Their allies include the New Zealand Unite union, who successfully took on McDonald’s in their home country, and the North American Fight for 15 campaign. Monica is now eager to help McDonald’s colleagues in her home country of Spain fight for the same rights: ‘What we can get, all of them can get as well’. Bullying bosses only dramatise the dominant logic of a global system structured by corporations like McDonald’s, where numbness to human suffering becomes a prerequisite for economic survival. The McStrike campaign offers an inspiring counter-model; refusing the normalisation of abuse and building networks of solidarity across borders. Monica, who has worked at McDonald’s for 5 years, is defiant it will continue: ‘We are enough now to make noise and make them listen. [..] It is just the first step of our fight’. To support the workers, attend the Crayford McDonald's picket from 6 am - 8 am Monday 4th September or 6 - 7.30 am at the Cambridge picket. Canvass local staff and write to McDonald’s to register support for the strikers. If you can't make the pickets, solidarity events are happening on the day at Parliament Square in London at 11 am. Speakers include John McDonnell and Jeremy Corbyn of the Labour Party. There's also a public meeting at 7 pm at Dragon Hall, 17 Stukeley Street, London WC2B 5LT where Shen Batmaz, one of the McStrikers, will speak.